Every year, new and innovative technology floods the scene. Unfortunately, the hype dies down after a while and we wait for the next big thing. I’ve learned a bit about Google Glass, as my professor uses it during class. We’ve discussed the future of wearable technology and I personally have no idea what’s next. Although Google Glass is pretty nifty, lightweight, and wearable, I only question the future of the device. What will they do to improve it? Will there be anything done to perhaps even out the asymmetrical look? I personally don’t like how it’s one side holding the battery, CPU, camera and prism. For quite some time, I was really not into the idea of Google Glass. I’m very into mobile devices, just not so much on wearable technology. Until UofL opened my eyes-literally-to something different. On November 9, UofL had their home-opener game against College of Charleston. Prior to the game, there was a national championship celebration that recapped the championship game and unveiled the 2013 banner. A video took storm after this game, why? Because a new perspective was brought to the fans and the team. 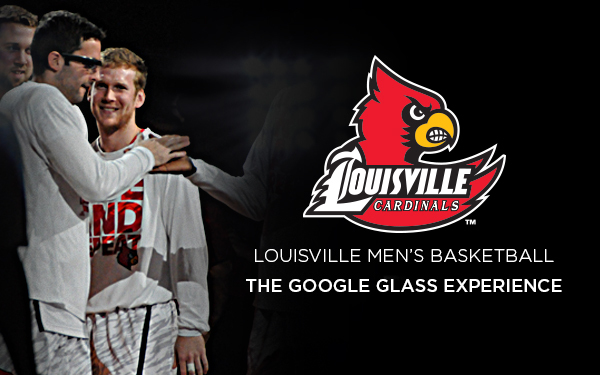 Number 11, Luke Hancock aka LUUUUUUUUUUUKE, wore Google Glass as part of “The Google Glass Experience.” The video opens with him warming up on the court-while wearing Google Glass! Once you get over the initial motion sickness of how much Luke moves around, things become more clear. The picture quality is great and the sound is on point. You can hear everything he says and what others around him says. Later in the video, you get a double screen of what he’s seeing and what was shown on the jumbotron. My opinion changed completely on Google Glass after watching this. The ways you can use it are limitless. It’s amazing to be on the court with basketball players and see what they see. And, the entire video Luke Hancock keeps saying he is wearing secret agent glasses…that’s pretty fun. If you haven’t seen the video, I highly recommend you check it out here. I will warn you: it does take getting used to because there is a lot of movement.